Looking for the best lemon squeezer? This guide can help! We'll show you a wide variety of different models to choose from for any budget. Our top 5 picks for the best lemon and lime squeezers. The different types of models available and when to use them. The pros and cons of all the selected products. ​Why Use a Lemon or Lime Juicer/Squeezer? How Do These Models Differ? Which Lemon/Lime Juicer to Pick? Just a splash of lemon juice can elevate the status almost any meal, taking it from bland to delicious in mere seconds. With all those pesky seeds, however, it is vital to use a good quality lemon press to effectively separate the juice from the rest of the fruit. While it is possible to use your hands to juice a lemon, you risk getting pips in your food, burning your hands and getting some of the lemon “flesh” in your food/juice. A good quality lemon press will also extract more juice from your lemons than you are able to do using just your hands. This ensures that none of the fruit goes to waste, giving you the most bang for your buck. If you are juicing a large volume of lemons to make lemonade or to curdle a new batch of nut cheese, a lemon press will enable you to process them in a short amount of time. Despite being such a simple and commonplace kitchen gizmo, lemon and lime squeezers actually come in a variety of designs, shapes and sizes. This can make it confusing if you are trying to decide what kind of model to buy. If you are a keen chef –amateur or otherwise –it makes sense to opt for a more sophisticated model. This can be anything from an electric powered device to a manual hand operated one - like a lemon press. These allow you to get through large volumes of lemons in record time. Larger, more robust models are especially suited to making lemonade, which requires lots of lemons to be juiced at one time. Those of you who know they are going to be using their lemon press more sporadically may wish to opt for a simple model that takes up little space and doesn’t cost much. These models are ideal for things like salad dressings, lemon water and if you’re using a splash of lemon juice to add to sweet or savory recipes. One final thing to consider is whether or not you want your lemon press to separate pulp from the juice. While some devices allow you to modify how much or how little pulp you want, others automatically “process” your citrus fruit without pulp so if you’d like the flexibility of having pulp/no pulp, then it’s best to opt for a lemon press that gives you the option. There are more and more lemon juicers on the market that allow you to choose whether or not you want your juice with or without pulp. This BPA-free lemon press comes in a sleek, attractive design and features a unique, double sided strainer spout that allows you to pour your juice with as little or as much pulp as you desire. The detachable reamer is built to an extremely high standard, ensuring that you extract every last ounce of juice from your lemon. The size of the reamer allows you to juice all kinds of citrus fruits besides lemons –from the smallest lime to the largest blood orange or grapefruit. It also has a strong “grip,” meaning it holds your fruit securely without the risk of slippage. This device is for people who are serious about juicing lemons. 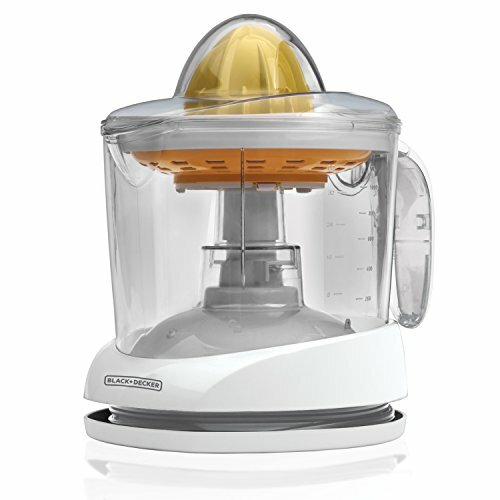 Unlike conventional lemon squeezers, this one is powered by electricity so whether you’re juicing lemons for your kid’s lemonade stand or making orange juice, this one will get through fruit in record time. This 30-watt electric juicer has a 34-ounce capacity and even has an auto reversing reamer, which allows for maximum juice extraction. There is also a feature that allows you to adjust the amount of pulp you want so whether you like your OJ with or without pulp, this device has got you covered. The standard size cone allows you to juice any kind of citrus juice you like, whether it’s a lime or a grapefruit. The storage cup comes with a drip-free spout, which means that you don’t have to worry about making a mess of your kitchen counter. The cord wrap and dust cover make for efficient, fuss-free storage. All parts of this device are dishwasher safe, which is great for fast and easy cleanups. This is a very high-quality citrus press that also happens to be budget friendly. It comes with two juicing cones, making it ideal for juicing different sized fruits such as grapefruits and limes. This device is pressure activated and is electrically operated so very little elbow grease is required in getting it to extract juice. It is also slip-resistant so you don’t have to worry about making a mess or your hand slipping out of place. The auto-reversing cones allow you to extract every last drop of juice so that nothing goes to waste while the pulp strainer allows you to modify how much pulp you get in your juice. While bigger than your average citrus press, this model comes with a storage cover cord storage, which makes it easy to store if you’ve got the space. All removable parts are also dishwasher safe and it comes with a pulp basket, making cleanups easy and fuss-free. An added bonus is that this device comes with a 2-year warranty. If you’re tight on space or don’t see yourself getting too much use out of your citrus press, then it might make more sense to go for a smaller, simpler model. 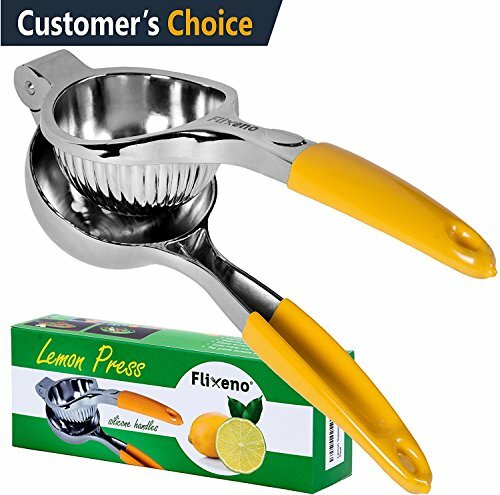 This is a classic lemon press made from top grade stainless steel and non-slip silicone handles. 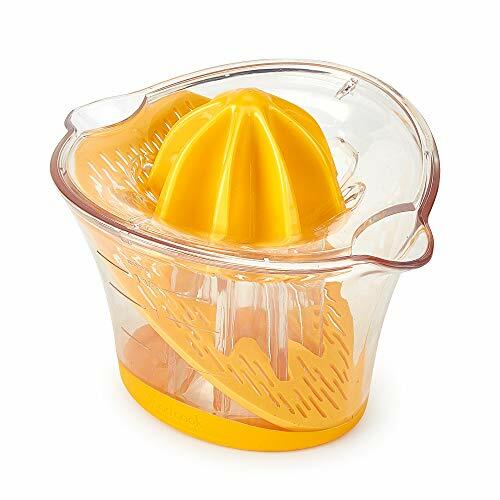 This design is ideal for people who simply want a sleek, ergonomic lemon squeezer that can be used for lemon water, homemade sore throat remedies, raw vegan desserts and salad dressings. This is not ideal for making lemonade or orange juice or for processing large quantities of citrus fruits. Although it can be used to squeeze grapefruits or other large citrus fruits, you end up losing a lot of the juice in the process and so it is better if you stick to lemons and limes, which it processes like a charm. The perforated basket and textured clamp ensures that every last drop of juice is extracted from limes and lemons. The pulp is all captured in the main body of the device, making for easy cleanups. It is also dishwasher safe. This lemon press stores like a dream, too, taking up very little space in a drawer. It also comes with holes on the handles, allowing you to hang it up on a hook. Don’t be fooled by its small size –this is a robust and heavy duty little gadget and is one of the best small models on the market. The futuristic design of this citrus press makes it an attractive option as far as aesthetics are concerned. 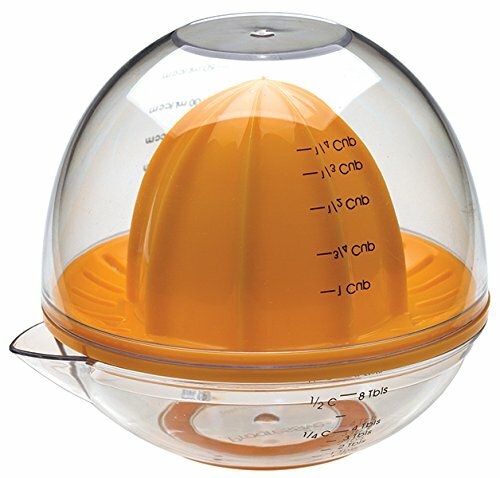 The dome lid keeps it safe during storage and also doubles up as a measuring cup. The printed measurements on the side of the cup come in millimeters, tablespoons and cups making it ideal for bakers. The no-skid base makes it safe and easy to use without running the risk of slippage or spillage. The pour spout is designed to a high standard, meaning that you don’t have to worry about half your juice ending up on your counter as you pour. Although this juicer is sized to fit lemons and oranges, it does a better job at juicing lemons and limes than it does oranges and larger citrus fruits. Oranges are a little too bulky for this press and so you end up wasting a lot of the juice in the process. This juicer does a great job at separating the juice from the pulp and seeds, however, you won’t be able to adjust or modify the amount of pulp you get in your juice. That being said, if you like your lemon and lime juice with no pith, then you could do worse than this device. As you've probably deduced, all of the lemon juicers and pressers on this list have their set of pros and cons. What you pick is going to be dependent on your intent with using it. If you just need to juice a few lemons or limes here and there, go with a manual lemon presser. If you need something a bit more heavy duty, the electric models are a great pick.